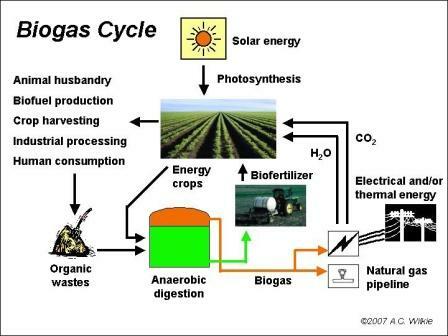 In a generic biogas production plant, biogas is essentially produced from carbon that is fixed by photosynthetic organisms, which capture solar energy, using water, atmospheric CO2 and soil nutrients. These crops are harvested for use in human and animal foods and in industrial processing. Residue from crop production and processing, manure from animal production, and wastewater from industrial and municipal sources all contain waste organic matter, which can be converted to biogas. In addition, energy crops can be grown that are used directly as a biogas feedstock. The biomass, waste, or wastewater feedstocks are conveyed into the anaerobic digester where a consortium of natural bacteria feed on the organic matter producing simpler intermediate compounds that are eventually converted to mineralized nutrients and biogas. The biogas is insoluble and separates into the gas phase and is removed from the digester through piping that conveys it for storage or final use. The remaining liquids contain plant nutrients, which are best used by returning them to crop production. The biogas is burned for energy production converting the methane into the same amount of CO2 that was fixed during photosynthesis.